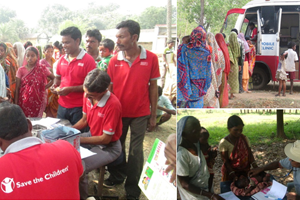 The Mobile Health Unit (MHU) programme was launched in Purulia, West Bengal in September 2011 by Save the Children in collaboration with the Department of Health and family Welfare through Centre for Environmental and Socio-economic Regeneration (CESR), the partner NGO. The basic mandate of the programme is to make essential medical services available in remote rural areas where access to medical service is limited. 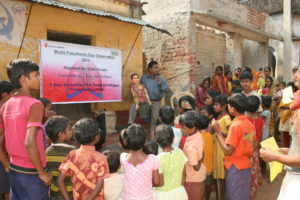 MHU was launched in four Gram Panchayats, viz., Panipathar, Chandra, Pirrah and Kenda in Puncha block of Purulia district. MHU is a composite unit consisting of one single bus fitted with necessary infrastructure for medical examination, diagnostic tests and distribution of a wide variety of medicines. The MHU has qualified and experienced human resources comprising of a Medical Doctor, a Nurse, a Laboratory Technician, a Pharmacist and a Driver. 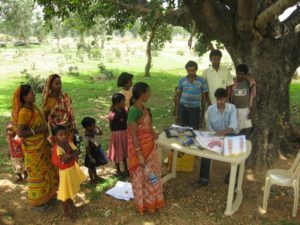 The MHU conducts on an average 40 clinics per month in four GPs and caters to around 45,000 population in 57 villages. The services provided by MHU are – curative, diagnostics preventive, referral, counselling and awareness generation. A minimum registration fee is charged from the beneficiaries. A registered beneficiary is entitled to medical check-up, diagnostic tests and free medicines as prescribed. Referral to a higher grade medical facility is another service offered by MHU. 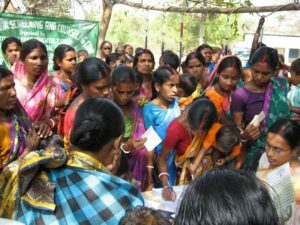 Apart from the Department of Health & Family Welfare, other key stakeholders of the project are functionaries of the ICDS, representatives of Panchayati Raj Institutions, CBOs, and women members of Self Help Groups. 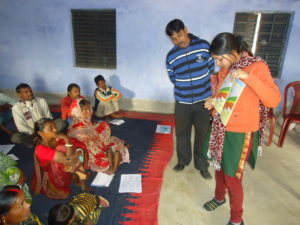 Extensive community mobilization mechanism has been undertaken since inception and these include village level meetings on regular basis, advocacy with PRI members and involving them in all major programmes, advocacy with the government officials for periodic review of the programme and formulation of action plan. Besides, communication and campaign initiative is undertaken through wall writing, folk songs, talking doll show, distribution of printed handbills and organizing theme-based programmes on safe motherhood, breastfeeding, nutrition etc. Since last three years, the project is being implemented in the specific project areas. Since inception of the programme, capacity building is one of the focus areas and programmes are organized on regular basis for training and orientation of the Project Staff, Frontline workers including ASHA, ANM and AWW and members of Self Help Groups (SHGs). The project has implemented two innovative initiatives: (i) seasonal morbidity exercise and (ii) tracking of pregnant mothers. Under the seasonal morbidity exercise, seasonal morbidity pattern in the project area for 2012 was analyzed in detail and on the basis of the findings, awareness programmes for the frontline workers, CESR staff and SHG members have been conducted in order to formulate preventive strategy for management of possible outbreak of epidemic. The other initiative is tracking of pregnant mothers, mostly by the members of SHG, so that proper ANC, institutional delivery and PNC is ensured. As a result of intervention, there has been marked improvement in all the indicators in the project area. On an average, in two years of operation MHU has catered to 72 patients per day on an average. Timely referrals from MHU have proved to be extremely beneficial to many patients. It is evident from data and voices of the people that MHU has had positive and enabling impact in the area Apart from increase in the rate of institutional delivery and immunization coverage, the perception and health seeking behaviour of people, even, in some cases, among the most backward tribes, has demonstrated improvement. That the MHU and the government health system is mutually supportive has contributed to greater impact of the project. 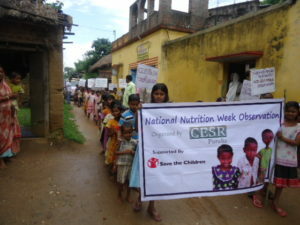 All Rights Reserved to CESRINDIA.ORG | designed by BYTEROOT Technologies Pvt. Ltd.